Trash Bubbles Heart the Earth! The project has evolved, becoming the vision. On Friday, it will be delivered for inclusion in the AABC Art of Recycling Show which begins April 19th and runs through May 11th, in honor of Earth Day on Monday, April 22nd. The Road Side Basics trash bubble was part of the Trash Bubbles ❤ the Earth mobile. Its contents were collected along the roadside. 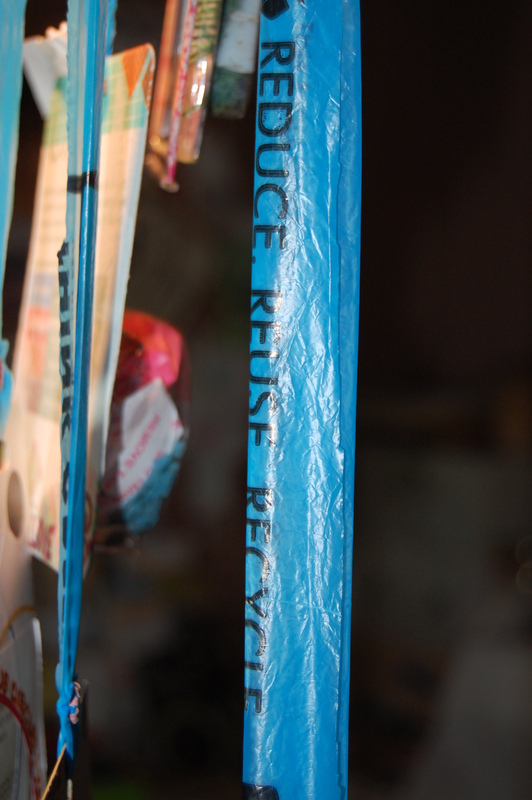 The ribbons, from which the bubbles hang, were strips cut from a recycled plastic grocery bag. 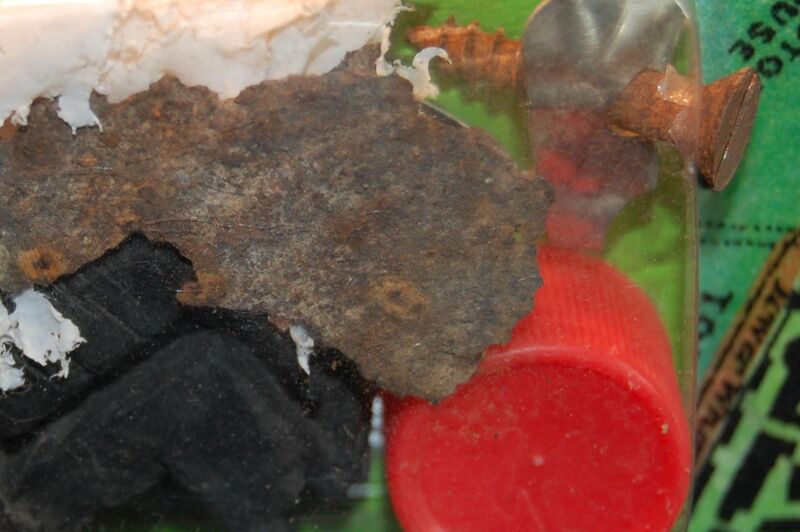 My favorite bubble when I began the project was Litter Bug. Now that the project has come to an end, I find that I have no real favorite, but I’ll leave you with this close-up of Road Side Basics. It makes me happy. If you have a favorite, I’d be interested to hear which one and why. As always, if you create a Trash Bubble, I’d love to see it. 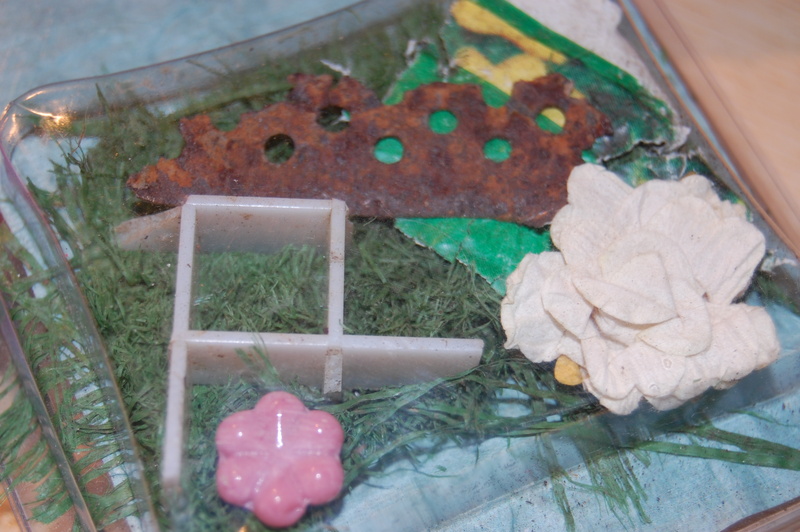 This entry was posted in Trash Bubbles and tagged art, Art of Recycling Show, assemblage, bubbles, collage, Earth Day, eco-friendly, ecospheres, environment, little bits, post consumer trash, trash, trash bubble, Trash Bubble Mobile by lkr1995. Bookmark the permalink. can’t wait to see it in person. See you at the show! Thanks, Jill. The photos really don’t do it justice. If I could only get to hang just so. See you at the opening next Friday?